So you are ready to harvest wood on your land or improve your current equipment. Many factors need to be considered when deciding on a small scale harvesting system. It is wise to spend some time reviewing these factors so that the equipment you choose will be suitable for years to come. Keep in mind that there may be more than one system that will work well for you and your woodlot. 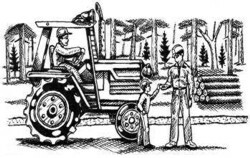 While many woodlot owners likely have some knowledge of harvesting equipment, others may be unfamiliar with it and the various ways it can be used. This lesson begins with a brief overview of the two commonly used machines and two attachments. Use cords per year (or metres cubed (m³) stacked ) as a rough guide only as amounts may vary from year to year. Costs are based on 2006 prices. ATV stands for All Terrain Vehicle, also known as a four wheeler. These are common in the woods of Nova Scotia and mostly used for recreation. They were originally built for farm and woodlot use. The advantages of the ATV are its versatility and relatively low cost. The small size and maneuverability can allow you to get close to the cut log. The disadvantage is that it is less powerful than a tractor and so production is lower. 1.1 ATV's are useful for harvesting small amounts of wood. An ATV may be a good choice if you want to harvest a small amount of wood per year (1 to 20 cords /4 - 70 m³). An ATV can be used for forwarding and skidding. It is also good for many recreational uses like hunting or hauling supplies to a camp. If buying an ATV, look for one with maximum ground clearance and a minimum 300 cc engine. The cost of a new ATV that can handle woods work begins at about $8,000. Tractors typically can produce more than an ATV and are more commonly used in Nova Scotia for harvesting wood on a small scale. They are a versatile machine for the landowner who may also want to farm, clear snow or brush, or run other accessories like a splitter. They are adaptable to many harvesting attachments and it is easy to get parts and service. Many forestry attachments have been purpose-built for farm tractors. Tractors are proven in the woods and have good resale value. A tractor is best for medium to large amounts of wood (20 to 100 cords per year/ 70 - 360 m³) but could also make sense for less than that if you have other uses for it. Tractors come in three groups based on Horse Power (HP): 20 HP which is a minimum but enough for small amounts, 40 - 75 HP which is most common and 110 or more HP which is harder on fuel and may not be cost effective. A new 20 HP tractor is about $12,000 with another $2,000 for the winch. Basin modifications for the woods can add another $7,000 ( see Lesson Two for list). A tractor over 60 HP will not be taxed. If you buy it with a cap and loader already attached , you do not pay tax on either since they are sold as a package. 1.2 A tractor has enough power to skid large logs. A minimum 50 HP engine (or 30 HP diesel) and a Four Wheel Drive (4WD) is recommended if you plan to make a living from the harvested wood. A 4WD has better weight distribution between the front and rear axle and so front-end rearing is less likely. However, a 2WD can work too with extra attention to prevent this. Another option is to buy a used tractor. A used 65 HP tractor costs about $16,000. Sources of new and used equipment are listed in Appendix B. Other equipment options are mentioned in Lesson Four. What other equipment options do you know of ? A winch can be attached to a tractor, a trailer, a sulky, a skidder or less commonly stand alone. It consists of a drum and a long cable for dragging the log toward the power source. The cable is attached to the log and then winds in over the drum. Winches come in many sizes and pulling capacities. Winches used with ATVs can be manual, electric, gas powered and hydraulic. Typical tractor models are powered by the Power take off (PTO) or auxiliary hydraulic ports. It is important to understand what power sources are available on your ATV or tractor before selecting a winch. Purchase a winch that is compatible with the power source on your equipment. Prices range from $80 (for a simple manual winch ) to $6,000. Trailers also come in many sizes and load capacities. You can load the trailer by hand, use a winch and boom combination, or a grapple loader. Be sure to select one that your equipment can pull safely when fully loaded. You may also decide to build one yourself or have one built. Some trailers have power supplied to the wheels from the tractor. If you have a pickup truck but no tractor, you can use the pickup to haul a trailer on a D Class road (depending on road conditions). Winches and trailers are covered more in Lesson Three along with other attachments. Harvesting equipment can be used in different ways and combinations to get your wood roadside. A visit to a local woodlot to watch equipment in action is invaluable for understanding how the equipment actually works in the woods. Felling the wood is described in Lesson Five. It can be cut into short wood or tree length depending on what you plan to use it for. This will also determine what attachments you use in terms of skidding and forwarding. 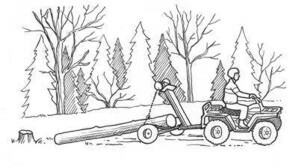 Moving wood from stump to roadside involves "skidding" or "forwarding" and sometimes both depending on distance. Forwarding wood is when no part of the log touches the ground. The logs are either loaded on a trailer or somehow supported at both ends. Skidding wood is when one or both ends of the log touch the ground. 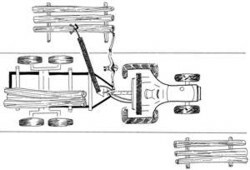 Skidding is further broken down depending on the equipment used. When a simple cable is attached to equipment and you must move the equipment to move the log, it is being "pulled". When you use a manual, electric or hydraulic winch to move the log closer to your machine , the log is being "winched". Both ends of the log are on the ground. When on end of the log is suspended or carried (in an arch or sulky etc.) and the other end is on the ground, the log is being "skidded". This can be done in one or two stages. Stage One: The log is winched to your machine. At the machine, one end is raised, then skidded and added to a pile on a main trail for final pick up or processing (processing could be milling, bucking or splitting). Stage Two: Sometimes, this pile is loaded onto a trailer and forwarded to a main landing. Logs are assessed and sorted here for off-site transportation or processing. WHAT'S RIGHT FOR YOU ? The following four factors need to be considered when deciding what is right for you. 1. How much wood do you want to harvest? If you have a management plan, you may already know your projected harvests. If not, you may still have a good idea based on past harvests. It may be as simple as how many cords/m³ of firewood you need each year. Or you want to get a minimum income every year from your woodlot. The amount per year will probably vary but try to figure out an average. Always consider how much wood you can harvest sustainably from your woodlot. A good rule of thumb is that a productive, managed forest can grow one cord per acre per year. Is this amount going to change in the next few years? Perhaps you are planning to buy an additional woodlot and cut more wood for sale. Take this into account as well. 2. What products do you plan to harvest? You may want to harvest firewood, sawlogs, pulpwood or other products like Christmas trees. Using small equipment and doing the work yourself may make it easier to harvest "specialty" products for artisans and wood workers. 1.5 What you plan to harvest and how much will determine what equipment is best for you. If firewood is your main requirement, then an ATV may be enough if you do not already have a tractor. You may thin out some smaller trees which can then be used for firewood. Smaller diameter wood is easily handled by an ATV. If you are harvesting firewood commercially, a tractor may be better as it has more power and can haul bigger logs. Do you plan to cut sawlogs to make lumber for yourself or to sell? If you plan to cut a lot of large diameter sawlogs, again a tractor may be best. Woodlot owners who plan to clearcut areas of their land every year will need a tractor. If you have a large area to cut, hiring a contractor may be more economical. 3. How much should you spend? For most of us, the first answer will be "As little as possible". But as purchases involve both costs and benefits, it is not that simple. 1.6 Both costs and benefits need to be considered when deciding what to buy. Is it important to you that the operation pays for itself or makes money? If so, you need to figure out value of the benefits: roughly how much the machine will save you ( in firewood costs for example) and make for you in sales each year. If you are using your ATV or your tractor for other uses, then that should also be considered on the benefit side. Then balance that against the cost of the equipment as well as operating and maintenance expenses. As one contractor advised, it’s not how much you cut but how much you have made at the end of the day. Lesson Seven provides a chart to help you evaluate your financial factors. Some small woodlot owners may not be too concerned about whether their equipment makes money or even pays for itself. The enjoyment, satisfaction and independence they get from harvesting their own wood offsets the cost . “ The lower fixed costs of small scale equipment can more than compensate for its lower productivity, resulting in increased net revenues per harvesting unit.” Applications of Small-Scale Forest Harvesting Equipment in the US and Canada. 4. What is your woodlot like? Site considerations are another factor in choosing harvesting equipment. If you have a lot of steep slopes or big trees, a tractor and a winch may be a better choice than an ATV. Certain attachments such as trailers do not work well in rough terrain. Stand composition also needs to be considered. Do you have mature areas that need to be clearcut? In this situation, small scale equipment is less productive. Or do you have an uneven aged forest where you do selection cutting and thinning? Under certain conditions like thinning, small equipment may be more suitable because it is more maneuverable and may do less scarring to remaining trees. Harvesting in wet areas or riparian zones requires planning and an understanding of current regulations. If you do harvest there, small equipment may be more maneuverable. Using a winch and boom can reduce the need to physically take equipment into these sensitive areas. In soft or shallow soil, it is important to avoid compacting or rutting the ground. This depends less on the size of equipment used than on pre-planing, tire width, extraction system, operator skill and ground conditions. See Lesson Seven for more information on reducing environmental damage. Check off your objectives for buying or improving your harvesting system. ____ To harvest _____ cords/m³ per year. ____ To sell ______ cords/m³ per year or earn $______ in income. By now you have a some idea of whether an ATV or tractor would be best for you. Here are a few more factors to consider. Other options for your main piece of equipment are in Lesson Four. You may already own a machine that you are using for woods work or other uses around your property. Perhaps it is getting old or worn out. Or you may own an old truck that you could convert to a truck tractor? The question is: Can it handle your woodlot needs? Is it suitable for woods work? Power requirements are generally low if the gearing is low, and less power can also mean less machine breakage. Can it work with some changes to the system? Is it adaptable to a bigger trailer or attaching a winch? If not, you need to consider buying a new or used machine. Make sure it will be compatible with the attachments you plan to use. Do some research. Talk with some fellow woodlot owners about what models work well for them. The Internet is also a good place to research different models of ATVs and tractors. Some excellent publications are listed in Appendix A and they are available for loan. Ask local equipment owners for retailers they recommend. You can also look in the Yellow Pages in the phone book under ATV, Tractor or Logging Equipment. 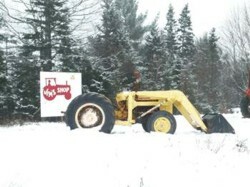 Most areas of Nova Scotia have an ATV retailer. If you want to buy a second hand ATV, also check used truck magazines which are widely available in Nova Scotia. Check retailer and used equipment ads in local forestry magazines (See Appendix B). You can look through a copy of The Green Pages, a directory of equipment dealers, contractors and consultants at your local DNR office. Companies that sell new tractors sometimes have used tractors (trade-ins) for sale. You may also be able to find used equipment at small local dealers. Photo1.1 Small local dealers may be a good source of used equipment. Other considerations are your level of skill and the time it will take you to do the work. If you are new to harvesting, it may be safer, faster and more profitable to hire a contractor for part or all of the work. For example, the contractor could cut and skid the wood and you could forward it. Or you could cut it and have a contractor forward it. If you have a large one-time harvest to be done, it may make more economic sense to hire a contractor than to buy or use your small scale equipment. This way you get the work done quicker and the money in hand. It may help pay for some smaller equipment so you can continue to cut small amounts yourself year to year. Before you hire the contractor, get an estimate of how much wood and what type of products will be cut. It may be mostly pulpwood or a mix of pulpwood and sawlogs. Consider getting an independent estimate for the standing wood to be harvested AND for the final roadside amount. 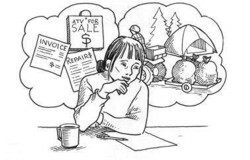 Talk to local woodlot owners to get their opinion of some local contractors. You can also look in the Yellow Pages or contact your local DNR office. Contractors are also listed in local forestry magazines. See Appendix B. When you talk to the contractor, ask for some references and call them too. Keep in mind it may only be possible to harvest when the ground is frozen or dry. Show the contractor your property and the area to be harvested. Discuss your expectations and harvest options. This will give you an understanding of what the forest will look like after harvest and if you want this contractor to do it. It is also a good idea to get the contractor to sign a contract though this is not common practice. This will protect you and the contractor. Also get a third party to witness. Are you the sole owner of the property? If not, the contractor will ask you to get the other owners to sign as well. You will likely need to create the contract yourself. Refer to "Hiring a Contractor", Module Two: Harvesting Systems for a list of points to cover in the contract. Also, a brochure called "Selling Standing Timber" may be helpful and is available at all DNR offices. It is important that the contractor is covered by Workers Compensation. Once you have an employer/employee relationship with the contractor, Workman’s Compensation and associated regulations come into effect. This may have an impact on what equipment is suitable for both harvesting and legal requirements.